Engine Four stroke, 75° V twin, DOHC, 4 per valve cylinder. By slowly working its way up from small-capacity scooters, to small trail bikes and now road machines, Hyosung hasn't exactly taken the local market by storm. It's been a somewhat more stealthy approach. Though watching the recent pricing policies of some of its immediate competitors suggests that there are big players out there which are taking the challenge from Korea very seriously. And so they should. 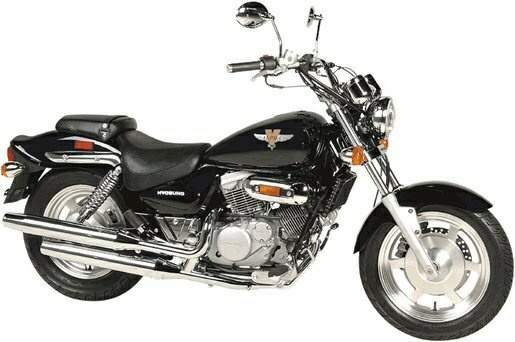 The Comet 250 is the third Hyosung we've taken for a fang - the others being the XLX175 trailie in August 2002 and the Aquila 250 cruiser last December. Both acquitted themselves well, particularly the 250. However, the Comet moves into a potentially more challenging area, where sports ability and outright performance is going to be looked at a lot more closely. So how did it perform? The air/oil-cooled V-twin is willing enough, showing acceptable bottom-end and a healthy midrange. Top speed on a low-kilometre example (barely run in) was in the region of 135-140km/h, which is in the ballpark for this class. It will run all day at 110km/h. The five-speed transmission was stiff at first, with neutral hard to find, but loosened up considerably during the run-in period. Clutch action was fine. Fuel consumption was a very miserly 23km/lt, even with hard use, which suggests a very good range out of the 17-litre tank. The gauge was very vague, though there's a tripmeter which - in combination with the miserly consumption - means there's no excuse for running out. 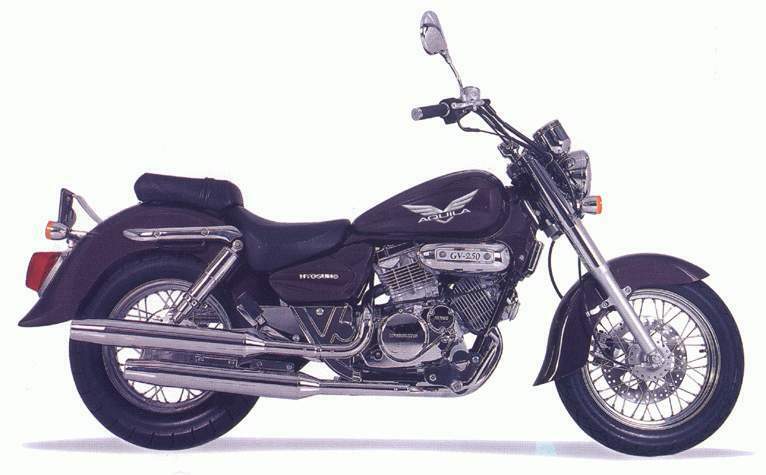 Hyosung originally developed the chassis to serve both the 250 and (with the addition of a second front disc) 600 Comets, but has since decided to give the bigger machine something more substantial. The effect of this was you have a frame which coped easily with the forces a 250 could chuck at it. Steering was neutral and the suspension - which needed some fine-tuning on our demo - showed lots of promise. Tyres were from Shinko, which hung on okay in the dry. Another side effect of the original 250/600 plan is the Comet is quite big by current 250 standards. Not huge, but you can probably forget it if your height is close to the old five-foot (150cm) mark. Taller riders will love it and I'll stick my neck out by saying it's the most comfortable 'standard' 250 out there for bigger folk. Brakes worked fine (our front disc had a slight warp, which is a straightforward warranty job), and the general level of finish was good. Maybe the simplest test of any bike is whether or not it puts a smile on your face, and I have to say the Comet did. The minute you mention that the machine is Korean, people immediately conjure up images of cheap and cheerful things like Hyundai Excel cars. Okay for the money, but not up to the standard of the Japanese offerings. The same thinking shouldn't necessarily apply to Hyosung. Long-term reliability out there in the market has yet to be proven, but at this stage there's every reason to believe the powerplants should last. As for the rest of the package, there are areas where improvements could be made and where the longer experience of the Japanese players shows through. But not to the extent many might think, and not to the point where you'd automatically cross the brand off the shopping list. In fact, the Comet's dimensions makes it one of the more desirable 250 mounts out there for medium to tall riders looking for maximum room to spread out. If I were in the market for this type of bike, I'd seriously consider giving this model a go.